DEDICATED DRUMMERS: Members of South’s drumline, junior Bryce Brennan, senior Michael Vilches and senior Grace Rodriguez (from left to right) diligently practice in the band room after school. The drumline is a close-knit group composed of 17 members, according to senior drum captain Michael Vilches. The powerful drum beats echo throughout the room. With each unified burst of sound, the excitement within the student body grows. This group of percussionists work hard to entertain and support South. 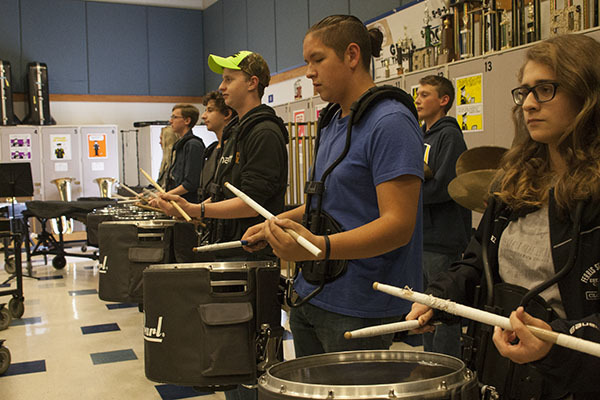 Drumline is a smaller group in the band program that focuses solely on percussion instruments. According to co-band director Brian Boron, 17 members are chosen in order to achieve the best balance of sound. He believes the drumline to be a hardworking group of kids. Drumline performs at many events in an attempt to express the Titan spirit, according to senior Spencer Peterson. He explained that drumline has inspired many students to pursue their passion of music including himself. Drumline is the only auditioned group in band and according to drum captain Michael Vilches this places a lot of responsibility on its members. Vilches says drumline has been rewarding as it has given him a sense of discipline. “In this day and age there’s a lot of kids that mess around, but I feel like once you enter the world of drumline and music … there’s a sense of structure and you feel more confident when you come out,” Vilches said. Vilches emphasizes how close of a group they are and how much time they spend together both inside and outside of school. He says that drumline is like a big family who come to each other when they need support. Junior Morgan Keime was influenced to join drumline by her older brother Taylor, who was drum captain last year. Keime says that drumline has given her an experience she will never forget. According to Keime, drumline has more girls than ever before this year. While there have been female drum majors in the marching band, there have not been female drum captains in the drumline. Hoping to further girls’ involvement in drumline, Keime says she strives to become the first female drum captain. “I’m going to apply to be a section leader because we haven’t had a girl drum captain in years, if ever, so I’m going to definitely try and change that,” Keime said. Similarly,Vilches has noticed an increase in girls joining the group with about an equal number of boy and girl members this year. “It has mostly been a boys club but we have definitely noticed a change and that’s cool because we’ve always been trying to get more [girls] involved,” Vilches stated. As the years progress, Boron hopes drumline will continue to flourish. He believes it provides an opportunity for involvement in South’s music program. He says the students bonds will continue to grow as the years progress.